This gallery contains some photos of the temple of Hatshepsut, which is also known as Deir el-Bahri. 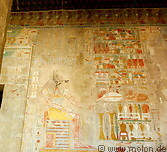 The temple lies on the west bank of the Nile river to the south of the valley of Kings and Queens necropolis. It is carved into the rock and consists of three terraces.